And the Wolfman came up next. Better get outta his way. It was a Monster's Holiday! In the 30's, even at the height of the Depression, monsters like Dracula and Frankenstein and the Wolf Man could find work. Sometimes they even got to team together to scare the living daylights out of the theater crowd. The 30's through the mid-40's were halcyon days for the fright masters. But then came the late 40's. 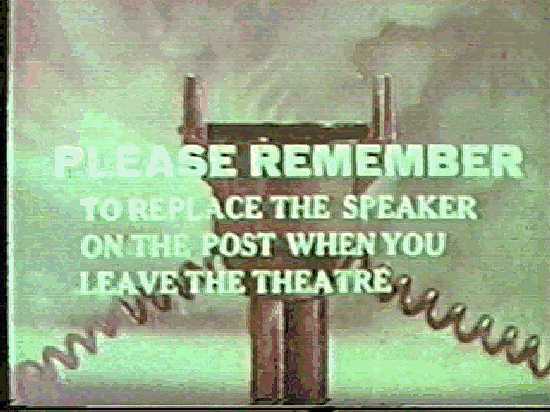 By this time the fickle horror fans had moved on and the classic monsters were passe, out of work. It must have been devastating to see the Wolf Man on the unemployment line, Frankenstein picking up day labor work as a gofer on a construction site, and Dracula sitting under a bridge with a cardboard placard that read "Will work for blood." Then came the most embarrassing moments of their lives. Their agents called and said they had work for them. But it turned out that work was as comic foils in a series of movies with a comedy duo, Bud Abbott and Lou Costello. It was work, they were going to be headliners again, but not in the classic scare movies they had made their bread and butter in the years previous. 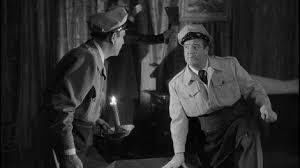 This time they would only be scaring Abbott and Costello, while their audiences would be howling with laughter. The preface above is written tongue-in cheek, of course. I thoroughly enjoy the twist on the old Universal Monsters being paired up with Abbott and Costello. 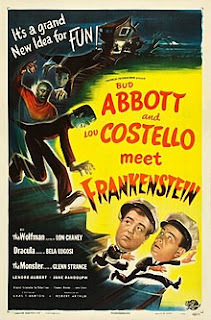 The run of the Abbott and Costello versus classic horror monsters numbered 5 theatrical releases (Abbot and Costello Meet Frankenstein, Abbot and Costello Meet the Killer, Boris Karloff, Abbott and Costello Meet the Invisible Man, Abbott and Costello Meet Dr. Jekyll and Mr. Hyde and Abbott and Costello Meet the Mummy.) There was also a meeting of the Creature from the Black Lagoon on their syndicated TV show. 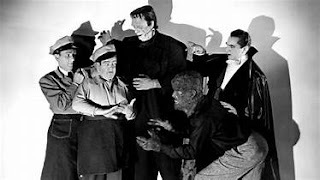 Universal Studios went full bull goose loony with the first outing however, pitting the comedy duo not only against the titular Frankenstein monster, but also had the addition of Dracula and the Wolf Man (and a brief cameo by another Universal monster headliner, the Invisible Man). Abbott and Costello Meet Frankenstein is considered by many to be one of the top comedy horror films of all time. 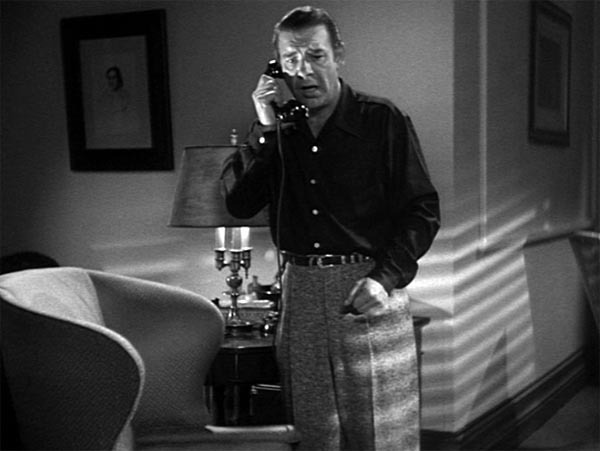 The film opens with a worried Lawrence Talbot (Lon Chaney, Jr.) trying to get a phone call through from London to Florida. He is desperate to deliver a message to the customs office there that under no circumstances should a couple of crates bound for McDougal's House of Horrors be delivered. 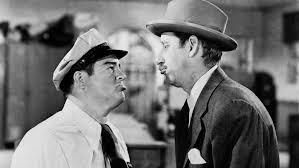 Unfortunately, not only is Talbot under duress because he is about to be turned into his arch-nemesis/alter ego, the Wolf Man, the customs office is being run by a couple of dimwits; Chick (Bud Abbott) and Wilbur (Lou Costello). Wilbur tries to carry on a conversation with Talbot, but unfortunately Talbot is a dollar short and a full moon late. He turns into the Wolf Man during the telephone conversation and Wilbur dismisses him as a kook. Meanwhile, Mr. McDougal (Frank Ferguson) shows up, a blustery windbag, demanding that the two customs agents deliver his packages personally. While delivering the packages, the two dolts manage to exasperate McDougal in many ways, not the least of which is mishandling his prized packages. It turns out that the two packages contain the coffin of the legendary Count Dracula (Bela Lugosi) and the Frankenstein monster (Glenn Strange), which Mc Dougal plans to make showcases in his wax museum. Wilbur has attracted the attention of Dr. Sandra Mornay (Lenore Aubert). She coos and frets over Wilbur, which only serves to make Chick jealous. Chick being the ladies man of the pair. 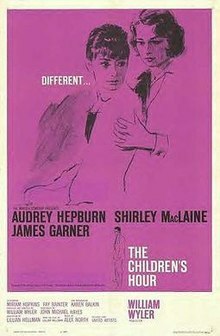 And when MacDougal has the pair arrested for damaging his packages, they are bailed out by a woman, but it turns out that it is not Wilbur's admirer. It is Joan (Jane Randolph). And she too coos over Wilbur to the consternation of Chick. It turns out that both of the women have ulterior motives for flirting with Wilbur, however. Joan is really a private investigator for the insurance company that insured McDougal's packages and thinks she can get the information on what happened by getting in with Wilbur. And Sandra? Well she is working in cahoots with Dracula. 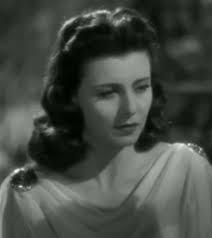 She and Dracula want Wilbur's brain to transplant into the Frankenstein monster. 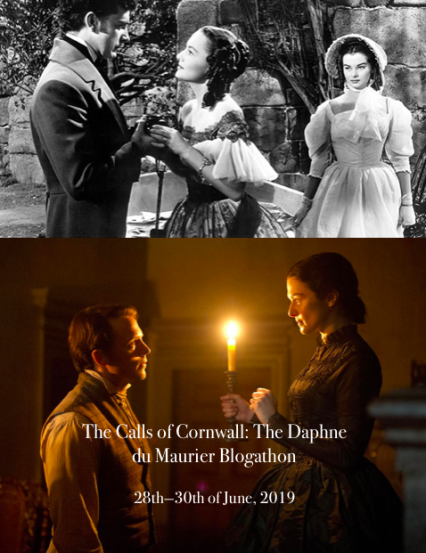 (Not that much of an improvement...) And Talbot (remember Larry Talbot?) knows of the nefarious plans. So he tries to work in conjunction with Chick and Wilbur to thwart them. But then he has a hairy problem that makes that a tough go. 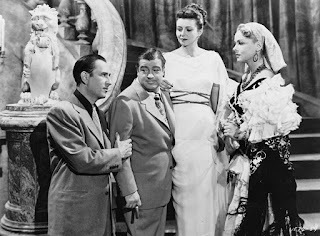 If you are familiar with any of the horror/comedy output of Abbott and Costello you can probably guess all of the vaudeville acts that are incorporated into the film. And of course Wilbur is usually the only one who encounters all the monsters (at first), while Chick berates him for being idiotic for even thinking the monsters are real. Talbot (Wolf Man): "I know you'll think I'm crazy, but in a half an hour the moon will rise, and I'll turn into a wolf." Wilbur: "Yeah, you and about 20 million other guys." Believe it or not, this was only the second time that Lugosi ever played Dracula. Yes he had been vampires in other movies, but none of them had been the original horror master himself. And of course there had always been only one Wolf Man, Lon Chaney Jr. As to why Boris Karloff did not appear as the monster, well there are several stories behind it. 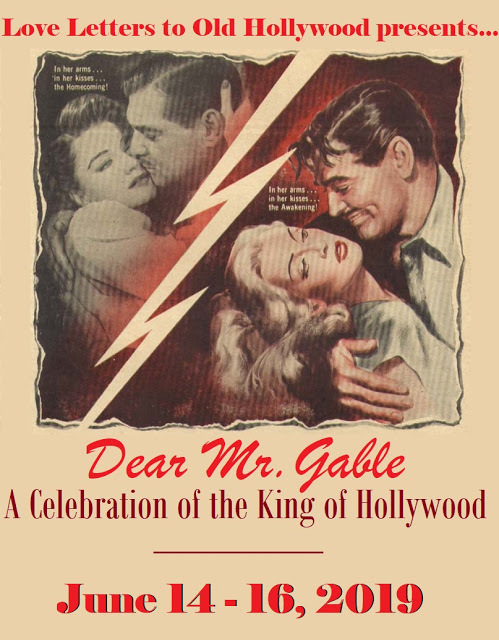 But the most believable one, to me, is that Karloff objected to his iconic role being played for laughs. 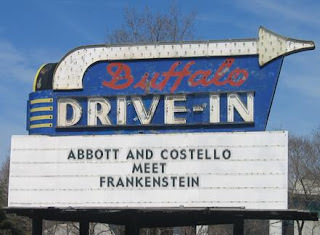 But apparently money talks, because he not only appeared in the next A &C output, Abbott and Costello Meet Boris Karloff, The Killer, but he was also the titular character in Abbott and Costello Meet Dr. Jekyll and Mr. Hyde. Hi Quiggy...I love this one, it really is the best comedy horror of all time...first time I ever saw Lugosi as Dracula, even before the 1931 film, and Glenn Strange does homage to Karloff as The Monster. I probably saw it one Saturday afternoon when i was a kid watching those old movies the local UHF stations ran, but I really didn't remember it. 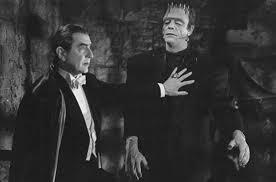 I personally think the Glenn Strange Frankenstein was more of the inspiration for Herman Munster than the Karloff one. 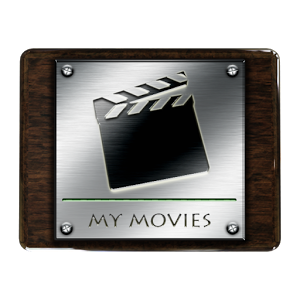 It is a good funny movie. Next year I may go into some of the other A & C meetings. I got started way too late on it this year. Thanks for reading, Chris.